In the Northern region of the Mentawai Islands you will find one of the most wave dense areas on earth. Playgrounds is the true heart of the Mentawai Islands thanks to more than 20 quality surf breaks within a 40 minute radius. Primarily suited for Intermediate to advanced surfers, those that make the pilgrimage can enjoy some of the planets best waves including Rifles, Kandui and E-bay. Known as Playgrounds (aka WavePark), the largest islands in this surf rich area are Nyang Nyang and Siberut and are home to a growing number of surf camps. 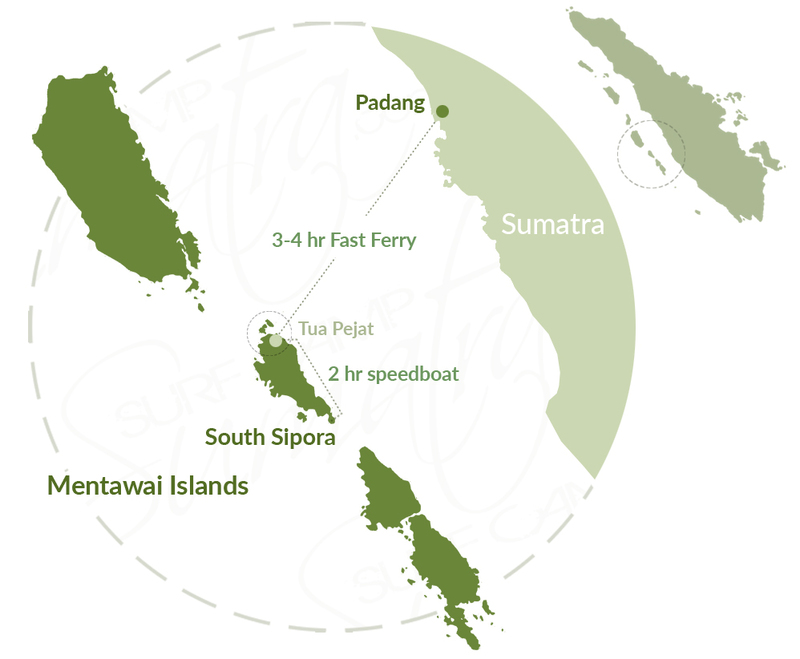 Surfers can best reach this remote corner of Sumatra by taking a Fast Ferry that departs Padang every Tuesday, Thursday and Saturday. The crossing takes 3-4 hours. Those opting to take a Charter Boat to explore the whole of the Mentawais can usually expect to spend at least 2 or 3 days in the area. About 1.5 hrs by speedboat, to the South of "Playgrounds", you will find the surf region of North Sipora. This surfing area offers around 9 waves that are within 5-20 minutes of each other, with the majority being left hander's. Best suited for intermediate surfers, a family or those simply looking for the least crowded waves in the Mentawai Islands. The region can cater for beginners, which is a rarity in Sumatra. For those wanting to experience this part of the Mentawais, its best to reach Sipora by taking a Fast Ferry that departs Padang every Monday, Wednesday, Friday and Sunday. The crossing takes 3-4 hours before arriving into Tua Pejat, the Mentawai Islands capital. Those opting to take a Charter Boat to explore the whole of the Mentawais might stop at one or two spots here, especially when a large south west swell is running in the hope of scoring the regions premier wave, Telescopes. It takes about 2 hrs by speedboat to travel the full length of the island to reach South Sipora. Here you will find 3 of the Mentawai Islands best waves, Lances Left, Lances Right (HT's) & Bintangs as well as a number of other well kept secrets. The region is known for its consistency as well as having off shore options in nearly all wind conditions. For those wanting to experience this part of the Mentawais, take the Fast Ferry departing Padang every Monday, Wednesday, Friday and Sunday. The crossing takes 3-4 hours before arriving into Tua Pejat, the Mentawai Islands capital. Guests will then need to take a speedboat to reach the southern part of the island. Those opting to take a Charter Boat to explore the whole of the Mentawai Islands will almost certainly spend a day or two here. In the Southern region of the Mentawais on the island of North Pagai, you will find just one camp & plenty of great surf. North Pagai is home to one of Indonesia's best waves, Macaronis. Its been described as the planets funnest wave and breaks with jaw dropping consistency. Primarily suited for Intermediate to advanced surfers, this region is home to several other quality waves including Green Bush & is also suitable for beginners. Guests looking to stay at Macaronis Resort can reach this remote corner of Sumatra by taking an Overnight Ferry that departs Padang every Tuesday & Saturday. The crossing takes 12 hours. A further 1 hr speed ride will take you to the resort. Those opting to take a Charter Boat to explore the whole of the Mentawais can usually expect to spend a day or two at Macaronis as well as Green Bush and many other waves located in this relatively quiet corner of Sumatra.